It was during the Keeneland September auction a year ago that we first saw the devastating impact of a plummeting economy on Thoroughbred sales. The large scale of the industry's largest yearling sale makes it a bellwether for every tier of commercial Thoroughbred breeding, and it quickly became clear that the recession would leave little room for profit at any level. Chatter from the shed rows to the sales pavilion a year ago centered on what would need to change — quickly — to avoid a repeat of the unsustainable losses suffered by breeders. Not long after the final hips walked through the ring, farms began to announce stud fee reductions for the 2009 breeding season. The move was inevitable; basic economics dictates that mare owners cannot afford to invest more in stud fees than they can expect to receive at auction for the resulting foals. A first round of stallion season cutbacks was modest; a follow-up fee reduction from many stud farms became necessary after early booking rates dropped drastically. The industry as a whole witnessed a decrease of 20 to 25% in average advertised stud fees. A year later, Keeneland's giant yearling sale again rewarded few breeders with runaway profits; many more were forced to sell regardless of loss just to recoup a fraction of their investments. Many broodmare owners are gunshy as they anticipate the upcoming breeding season; it's not hard to believe that they will expect, or even demand, similar stud fee reductions for 2010. Stallion owners, of course, feel the impact as well and are not keen to see further drops in revenue. Several farms had even indicated that 2009 fee drops were one-time specials; they hoped not to have to maintain the lower rates and certainly wish to avoid additional cuts. This disconnect makes watching for the industry's annual stud fee announcements an even more compelling sport over the next few months. 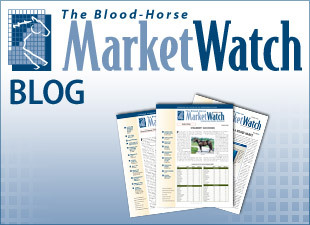 The Blood-Horse MarketWatch would like to know the expectations of its readers — the Thoroughbred industry professionals who closely monitor breeding and sales trends — for 2010 stud fees. Will farms be able to maintain 2009 rates? Will some attempt to revert to pre-recession stallion season pricing? Or, if additional cuts are called for, how much lower will rates fall? Our new survey will identify how different groups — breeders, stallion managers, industry observers — see the situation. The electronic survey will run through October 18, and results will be reported shortly thereafter.